Abstract: Justcom include two four foot and two six foot multimedia (audio, USB and video) cables! Integrating the USB, video and audio into one cable certainly makes cable management easier. For the computer technician a KVM (Keyboard, Video, Mouse) switch is an invaluable tool as it allows one to use multiple computers with just one keyboard, mouse and monitor. Since I'm the go-to guy whenever there's a busted computer among my circle of friends/family I often have three or four machines sitting in a queue just waiting to be looked at. With a KVM I can greatly increase my efficiency, after all what else can I do if I'm reinstalling on one machine and only have one keyboard, mouse and monitor?v With a KVM, I can do a complete system reinstall one machine, monitor stability testing software on another and perhaps configure a system which is about to be released. Justcom manufactures many different switches to suite your needs. 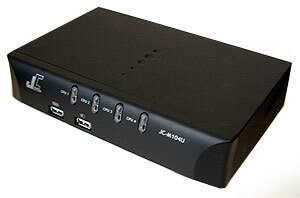 Today we're going to be looking at their JC-M104U 4-Port USB KVM Switch. For good measure Justcom also include two four foot and two six foot multimedia (audio, USB and video) cables! Integrating the USB keyboard/mouse, video and audio into one cable certainly makes cable management a lot easier. The JC-M104U also comes with DC 9V 1000mA AC Adaptor. One's first impression of the JC-M104U is that it's high quality. Unlike the JC104P, the JC-M104U is housed in steel with a clean plastic bezel front. Setting up the USB-centered KVM is extremely simple, and you won't have to refer to the manual during installation. The JC-M104U can support up to four computers at once and the KVM can even support resolutions as high as 2048x1536 @ 85 Hz! It's nice to see that you won't be limited to a low resolution or refresh rate due to the KVM. During testing the JC-M104U's picture quality was excellent and if you didn't know you were using a KVM you'd think the monitor was hooked up directly to the PC. While JustCom labels the front USB ports as keyboard and mouse, it really doesn't matter which ports you connect them to. Owers of optical mice will be happy to hear that the JustCom JC-M104U provides enough power for those laser mice we all love. The KVM even offers two additional USB ports on the back! While there are mic and speaker jacks on the back of the KVM, unless you have a two speaker setup you're probably not going to take advantage of the speaker options. Pg 2. What a package!